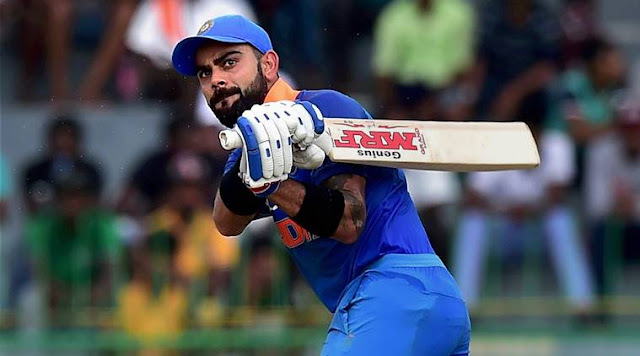 India vs West Indies: King Of Record Virat Kholi Made Fastest 10 Thousand Runs In ODI Cricket: Indian captain Virat Kohli has achieved another record in his name. Kohli has become the batsman who has scored 10 thousand runs in One Day Internationals. He broke Sachin Tendulkar's 17-year-old world record which he made in Indore against Australia. Earlier to this match, Virat Kohli's had made 9919 runs in 204 innings of 212 matches. He needed 81 runs to reach this record. During the Visakhapatnam match against the West Indies on Wednesday, he achieved this position on the Ashley Nurse ball in 37th over of the innings. Kohli completed 10 thousand runs in just 205 innings. Sachin Tendulkar completed 10 thousand runs in 259 innings on 31 March 2001 in Indore. The record for making the most runs in One Day Internationals is with Tendulkar with a total of 18426 runs. Followed By Ganguly is the number one behind Sachin Tendulkar in the list of highest run scorers who has scored 11,363 and Dravid 10889 runs and Dhoni has scored 10123 runs. We Congrat Virat Kholi on his great achievement of 10 thousand for every cricket fan.